Witch: He likes you. Will you take care of Prince for me a little while? I'm going to a party. Cindy Lou: I'd be glad to. Cindy Lou: H-h-he turned into a giraffe! Witch: He's liable to turn into almost anything. When I brew magic spells I often spill some. Prince has licked up so many spells his system is full of them. Witch: Whenever he hiccups he turns into something else. All of it drives my son insane with laughter, not to mention it tickles me pretty pink. 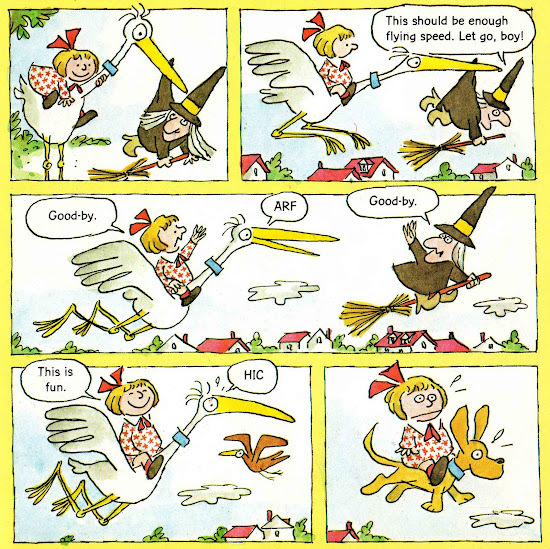 I love the panels where the dog turns into a bird and Cindy Lou flies on its back only to have it hiccup and turn back into a dog. 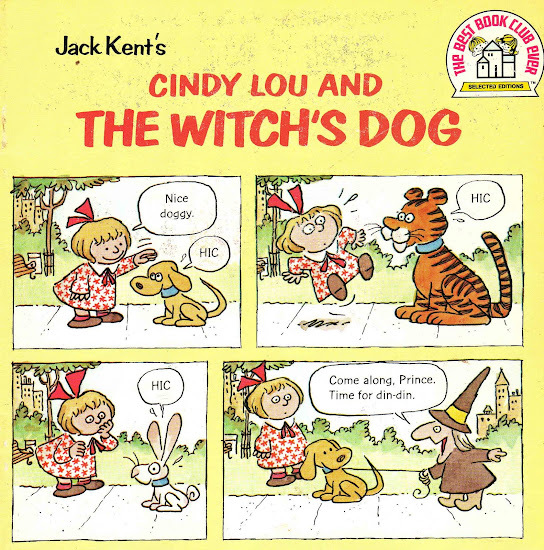 The timing is impeccable, and the look on Cindy Lou's face is beyond priceless. I've never seen this particular joke done before anywhere, but it must've been because it's so perfect. The execution here is flawless. 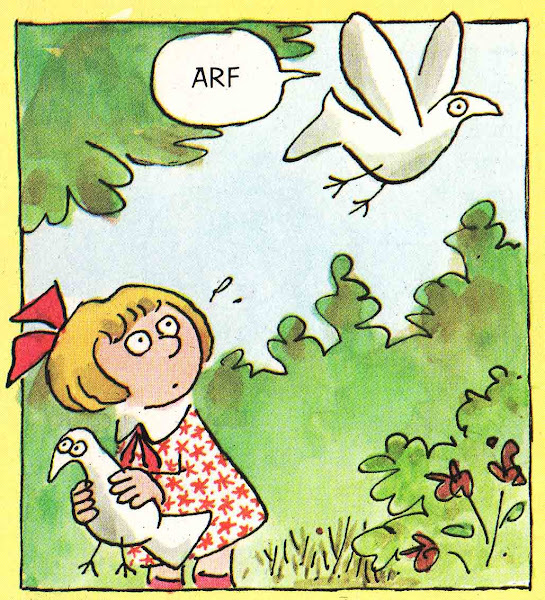 Jack used the same bit in a King Aroo panel once, so I'm wondering if the idea originated with him. 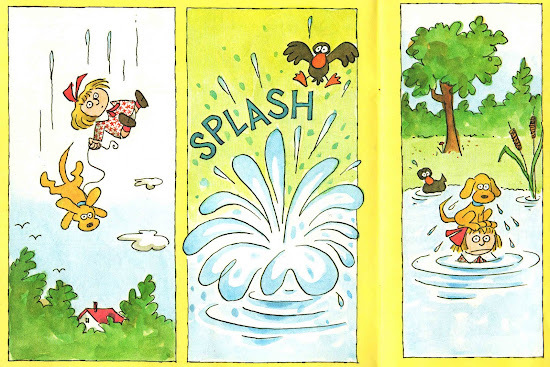 Every twist is followed by another crowning twist (elephant, dove, lion) until Cindy Lou finally cures Prince of his hiccups. Unfortunately... he ends up getting a cold. Ha! Man alive, Kent was a bottomless well of great ideas! Everything you've shown so far this week has been terrific, I can't wait to see more. A great book (finally one I have, ha ha)! I can't wait to see what is next! I have never seen the Jack Kent books you've been highlighting the past few days. Totally wanting to get my hands on some of these gems. Sounds like a lot of fun. 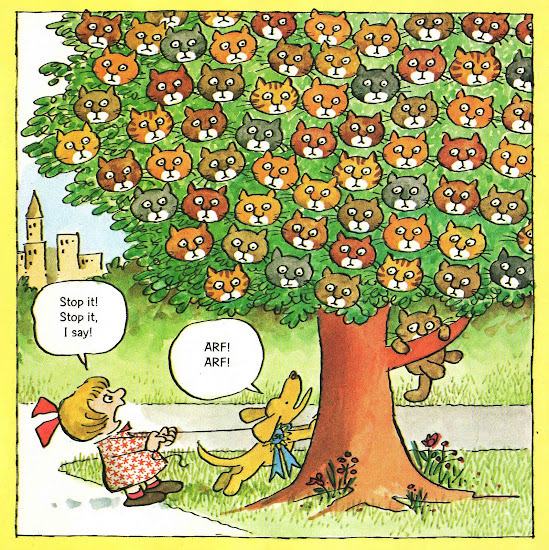 I love the image of all the cats in the tree.